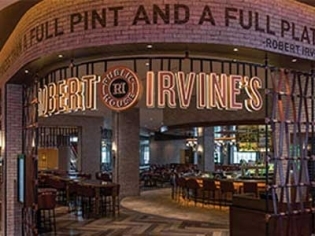 Food Network TV star chef Robert Irvine offers his spin on American pub cuisine with some traditional favorites and some unique twists in his contemporary Public House. The all day menu is offered at the same price whether lunch or dinner, a rarity in Vegas. The large dining room features a wrap-around bar and an open kitchen. The beer menu is extensive with almost 60 brews offered in bottles and cans, and another 30 on draft. If beer is not on your menu, try the specialty cocktails which are fun and unique. Save room for dessert with the English favorite of Banoffee Pie or the American favorite of Dark Chocolate Cake. The all- day menu ranges from pub fare like pizza and burgers, salads and sandwiches, to more hearty fare like Shepherd’s Pie and Lamb Shank.